Great Service while you wait, no appointment needed! To our Airdrie and surrounding area customers: Our staff is trained to provide an Express Lube oil change in as little as 30 minutes, as well as tire rotations, flat repairs and replacements. 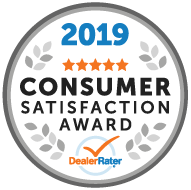 We inform service of manufacturer recommendations, and always ask before proceeding with any vehicle maintenance or service that was not outlined at greeting. Q: How often should I get an oil change? Q: Why does Davis Chevrolet GMC Buick recommend using Dexos1 oil? Q: I prefer to wait while my vehicle is being serviced, is this possible? A: Yes you may wait as we offer a quick service. We have a waiting area with free WI-FI and free coffee.! We also offer a shuttle service if you must be somewhere else! Q: Can I come right away or do I need an appointment? A: No appointment is neccesary. If you wish to make an appointment you can do so by calling or booking online! When you get here one of our service writers will give you an estimated time of completion based on the number of vehicles infront of you. Q: What does your 15 point inspection include? 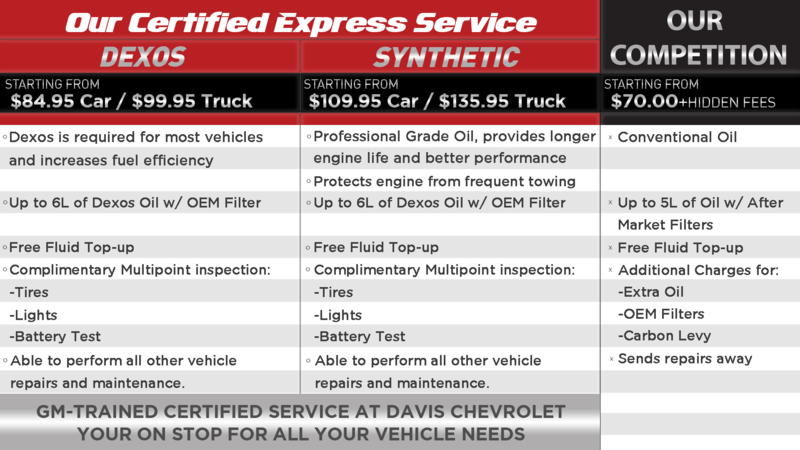 All the benefits of GM Certified Service without the wait…that’s Davis Chev’s new Certified Express Service!